A hammock tales outdoor relaxation to the next level but this is only true if you get a top quality one like the Quick Dry Rope Hammock from Patio Watcher. It uses a tough and quick-drying material that combines PVC and polyester and it is also spacious enough to accommodate two adults. A hammock tales outdoor relaxation to the next level but this is only true if you get a top quality one like the Quick Dry Rope Hammock from Patio Watcher. It uses a tough and quick-drying material that combines PVC and polyester and it is also spacious enough to accommodate two adults. 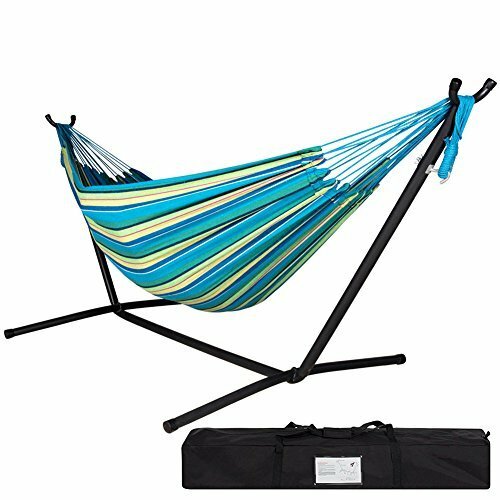 The hammock with stands up to 450 pounds and it is also quick and easy to install as it comes with everything you need to use it. And you also get to choose from more than half a dozen lovely colors. 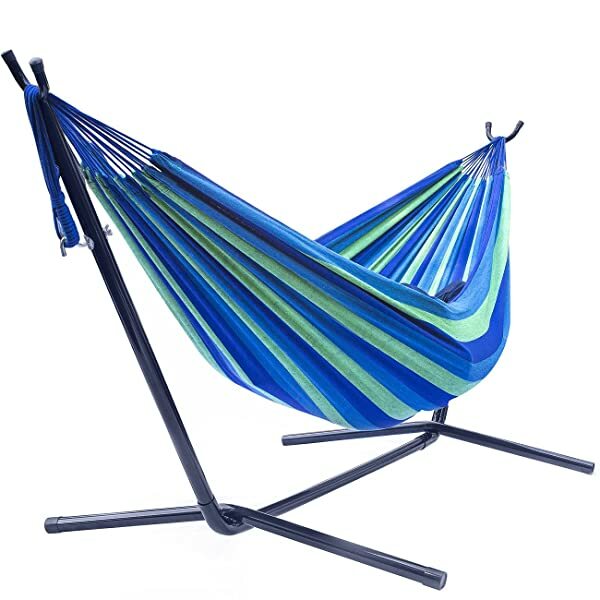 Material: Patio Watcher makes this hammock from a Textilene fabric which consists of 30% high strength polyester yarn and 70% PVC. And so you can be sure that it is a tough and durable product that will serve you for many years. Dimensions: This hammock comes in dimensions of 195 x 140 cm which makes it spacious enough to accommodate two adults comfortably. And if you factor in the steel chain link you will have a total length of 14 feet. 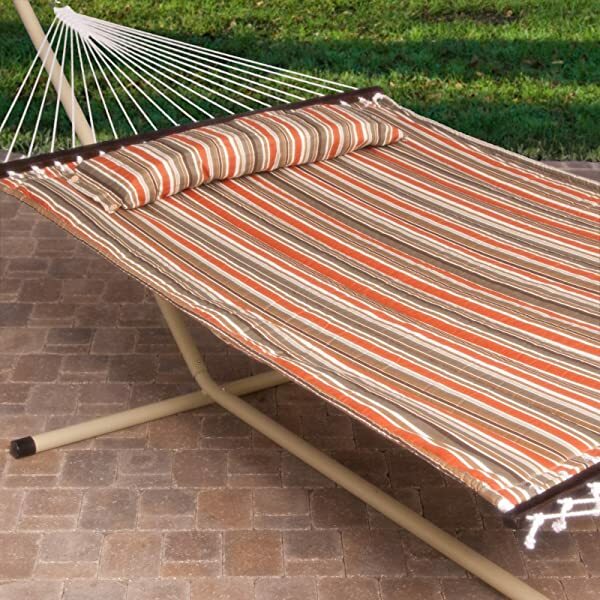 Weight Capacity: Despite only weighing around two pounds this hammock is still tough enough to withstand up to 450 pounds which is more than enough to accommodate two adults. 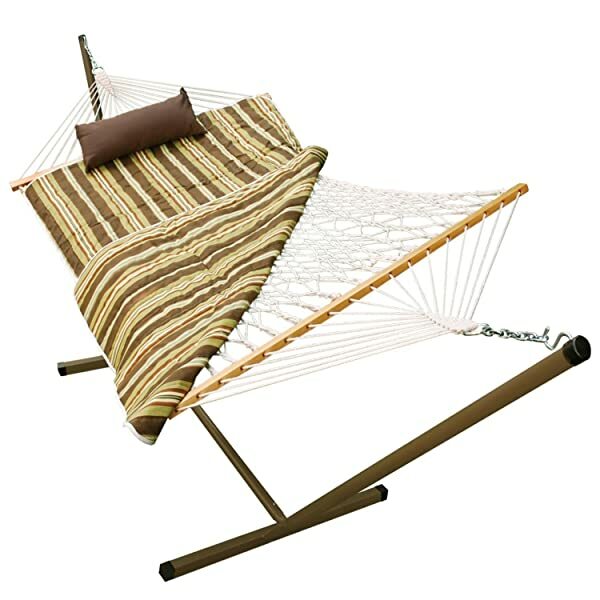 Ease of Use: You will never have to waste a lot of time installing this hammock as it is quick and easy to use. It comes with 20 string ropes attached to a ring on each side and a chainring and all you need to do is hang it on a stand or even between two poles. It is always a good idea to have a hammock that you can share with that special person in your life whether you are relaxing in your backyard or camping out in the wood. And this one will be perfect for this as it is not only wide enough but also withstands a lot of weight (up to 450 pounds). Also, the overall built quality is great and it beats most others that are within the same price range and also some pricier ones. 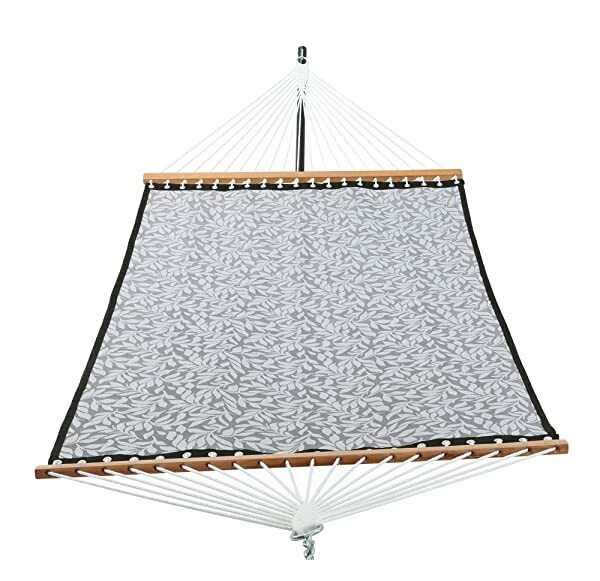 If you also factor in other things like the fact that it is easy to install and it dries super fast, you will have the perfect hammock for you. Even if you were to consider the few shortcomings like the fact that the material is a little too slippery and that the stitching is not the best this is still a great hammock. Hence if you are looking for a tough and durable double hammock for use on your camping and backpack excursions, this will be a perfect choice as it is also reasonably priced.